As another year has ended, I have to take the time to thank you. This blog was created for my own use, to be able to access blade information at any time; but it grew into something bigger. For each of you that use this site, I give a sincere thank you. This site is a personal site that I’ve maintained since Fall of 2009 and I get ZERO money to run it. No advertising dollars or anything. It’s a hobby, so your participation is greatly appreciated. That said, I thought for my first blog post of 2016, I’d provide you with some insight into the numbers. So here we go. It’s been a while since we’ve seen a Gartner Magic Quadrant for blade servers as they discontinued it in 2014. Last month, Gartner created a new Magic Quadrant to replace the older one. The newest Magic Quadrant incorporates both blade servers and multi-node servers. According to Gartner, “the separation of the blade and multinode server markets has become harder to maintain as multinode servers adopt the technology characteristics of blade servers. With the evolution of new modular server designs, the concept of traditional server blades will fade in favor of increasingly variable ‘bricks’ or ‘cartridges.’ Consequently, a Magic Quadrant that tracked only the blade server market could only deliver partial value. This new Magic Quadrant is designed to better reflect the evolving market for any servers that display modular characteristics.” You can view the full article here, but I’ve summarized their findings for the top modular server vendors below. 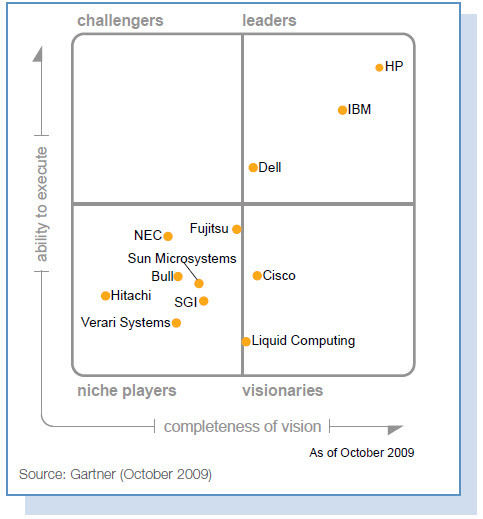 I received a Tweet from @HPITOps linked to Gartner’s first ever “Magic Quadrant” for blade servers. The Magic Quadrant is a tool that Gartner put together to help people easily where manufacturers rank, based on certain criteria. As the success of blade servers continues to grow, the demand for blades increases. You can read the complete Gartner paper at http://h20195.www2.hp.com/v2/getdocument.aspx?docname=4AA3-0100ENW.pdf, but I wanted to touch on a few highlights. *Blades are less than 15% of the server marketplace today. Obviously these Cautions are based on Cisco’s newness to the marketplace, so let’s wait 6 months and check back on what Gartner thinks. It will be interesting to see where Dell takes their blade model. It’s easy to have a low price model on entry level rack servers, but in a blade server infrastructure where standardization is key and integrated switches are a necessity having the lowest pricing may get tough. 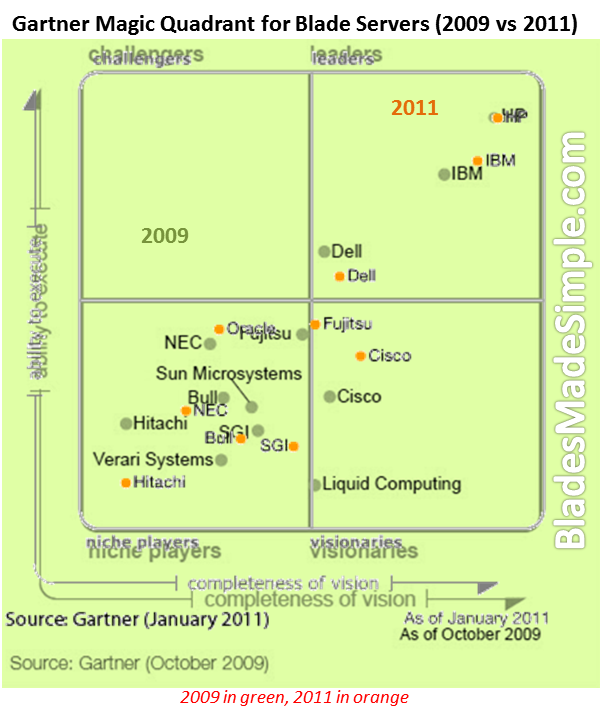 Gartner only lists one “caution” for IBM and that is their loss of market share to HP since 2007. Gartner only lists one “caution” for HP and that is their portfolio, as extensive as it may be, could be considered too complex and it could be too close to HP’s alternative, modular, rack-based offering. http://h20195.www2.hp.com/v2/getdocument.aspx?docname=4AA3-0100ENW.pdf. All-in-all, Gartner’s report reaffirms that HP, IBM and Dell are the market leaders, for now, with Cisco coming up behind them. Feel free to comment on this post and let me know what you think.